A free dress and some more Halloween Gifts. Home » GO DUTCH ! » A free dress and some more Halloween Gifts. Posted By Katia Millet on Oct 31, 2018 in GO DUTCH ! Just 2 days to Halloween Readers, so I can’t help it – lots of Halloween stuff on my blog today! But let me start with the group gifts you can find at Coco Designs. The group is free to join and they have plenty group gifts. I will show you more the next days, but today I am only showing their Halloween group gifts! So let me start with the oversized shirt with a pentagram sign on it. It is one of the gifts you can find at Coco Designs and it fits Maitreya, Belleza and Slink. And 7 Deadly s[K]ins is having a Skeleton Hunt till November 1st. This hunt is a bit more complicated, you have to get a HUD at the store, which is free. Wear the HUD, and find 14 bones at the store. As you come close to a bone it will light up. once you click the bone it will register on your hunt HUD [check mark behind the item]. They also have this Wednesday dress. It is not really called Wednesday, but it sure looks like the dress Wednesday Addams was wearing! 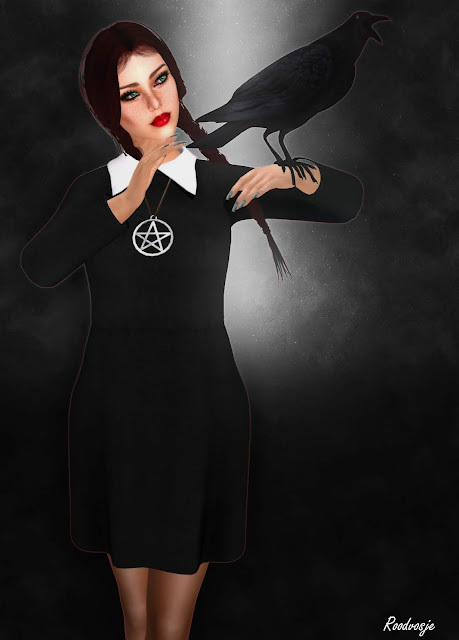 The Pentagram necklace is included and the dress comes in 3 mesh sizes, S M and L.
I styled this dress with hair I got from a Gacha machine at the Arcade. Each try is 75 L$ and you can win this Saturday hair, or another style in different hair tones, It is by Rama Salon. But I found more gifts at Coco Designs. 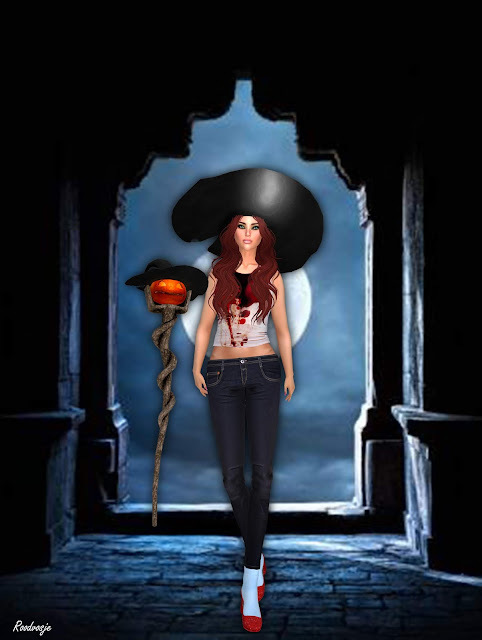 This bloody tee shirt for example, which fits Maitreya and Slink. 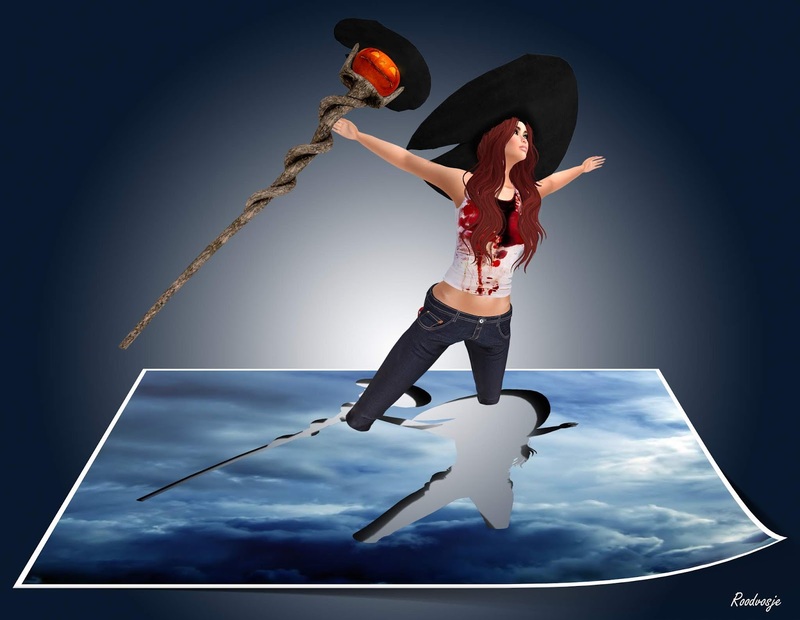 And the great witch hat, also a gift. So are the red glitter shoes with the blue socks, which are for classic avatars, but I took my feet off and they work too on my Maitreya body. The skinny jeans are also a gift and they come in fitted mesh sizes. Even the great Pumpkin staff is a gift at Coco Designs! It follows you where ever you go. Vertigo has 5 Midnight Mania boards for which you do not need a group. On these boards are female clothes and boots/shoes. The boards change often so you might not find what I am showing below, but they are always great to get some really nice free outfits! 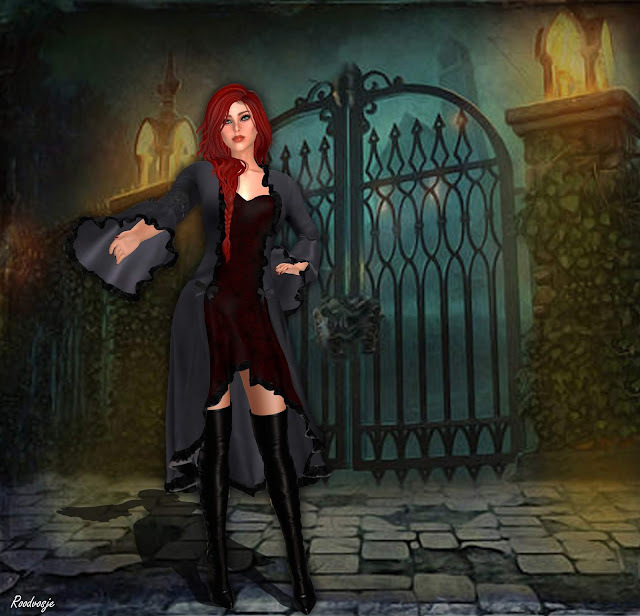 I got this awesome Madame dress/coat which comes in standard mesh sizes, but also as appliers for Maitreya, Belleza, Slink, TMP, Ocacin, eBody, and Tonic. I also got these over knee Loren boots from the boards there, which fit classic avatars, Maitreya, Belleza and Slink. I also got a lovely little Bimi dress, which you can find on the 3 lucky chairs at Baby Monkey. These chairs do not need a group to get the gifts, and there is a Midnight Mania board too, also no group! I got this cute dress, which fits Maitreya, Belleza and Slink and a colour change HUD is included, which gives you 10 options to wear this fun dress. 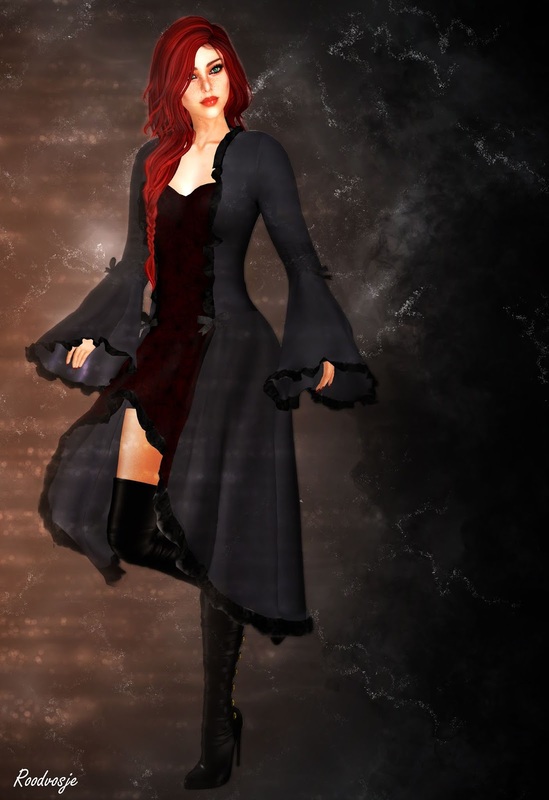 With this dress I am wearing stockings (Maitreya appliers) by Just Like That. They are 1 L$ and a HUD is included which gives you 8 options. With this awesome dress I am wearing awesome McCormack Road shoes by Heels which fit Maitreya only. The elegant Moth set in Autumn tone is by Zuri Rayna Jewelry. This set is also available in Dark (silver tone). The Moths are very detailed which makes this set even more special. Each set is simply gorgeous and this set goes great with a gown but also with a casual outfit, to compete your fall outfit or even your Halloween outfit. You get the necklace and earrings. I am wearing Kimmy hair by Mina. It was a gift at an event before but you can find Kimmy at the main store for 275 L$ you get single colours – each with 15 different tones.